1. 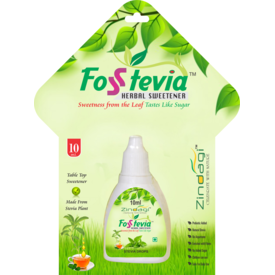 Zindagi FOSSTEVIA (FOS+STEVIA) is your natural and healthful replacement of sugar loaded with the goodness of prebiotics and dietary fiber brought to you through Stevia plant extract and FOS (Fructooligosaccharides). 2. FOS occurs naturally in the nature. It is a prebiotic dietary fibre found in several fruits and vegetables and produced through natural and safe processes. 3. STEVIA is a plant native to South America.The natural sweetener derived from the sweet leaf plant has no calorie, fat & carbs and is used as a sweet herb for decades. It can be used as a natural sugar replacement in all hot or cold beverages. One drop of fosstevia sweetener will give you delicious sweetness equivalent to 1 tsp of sugar. Team Zindagi is committed to serve you with the healthiest herbal sweetener with a great taste. Fosstevia is good for diabetics, obese and all health concussions people. Stevia is safe and is approved by US FDA and FSSAI. It is heat stable and can be cooked or backed while some of other sweeteners are made up with chemicals like aspartame, saccharin and cannot be cooked.